Besides OS X and iOS, however, Apple has also acquired or developed a series of iLife, iWork and Pro Apps, each of which has launched or tweaked user interface conventions. 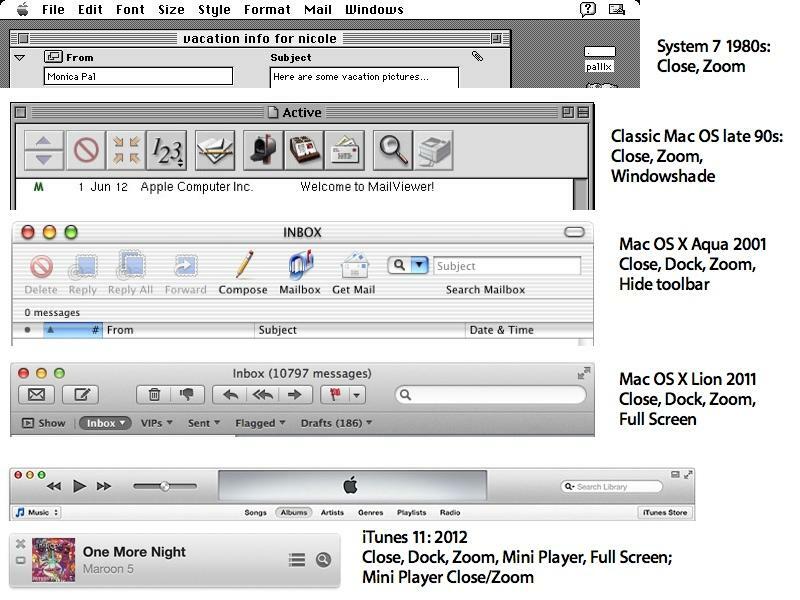 After acquiring Logic, for example, Apple carried forward its PC-centric interface for multiple releases before giving it a more Mac-like appearance. Apple has also delegated Pro App design to software leaders, a notable example being Randy Ubillos, who developed the basis of Final Cut Pro, originally at Macromedia. 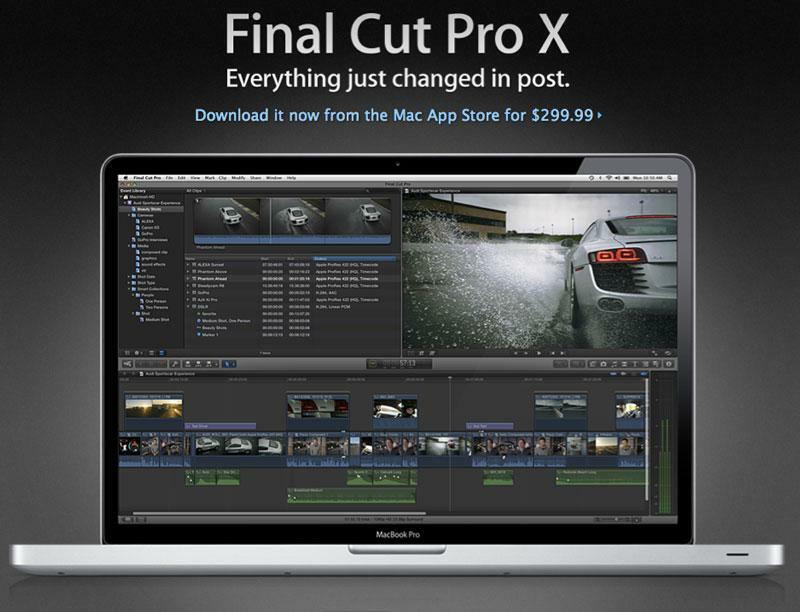 At Apple, Ubillos revamped Final Cut and a series of supporting apps, then redesigned iMovie to be easier to use. Much like iOS's influence on the Mac, Ubillos then led Jobs' directive to overhaul Final Cut Pro to target Apple's primary users, a design decision that ruffled the feathers of editors accustomed to how the software already worked. Ubillos has also designed mobile versions of Apple's Pro Apps. However, there are many cases where faster moving apps, platforms and initiatives continue at a rapid pace (such as iTunes) while other products in Apple's portfolio get less attention, and fall by the side (such as most of the other free apps bundled with OS X). At the same time, the company has also incited criticism by simply moving to new concepts too fast, or decisively adopting designs a lot of people simply don't like. In particular, Apple's recent fixation with giving apps fancy stitched leather and woodgrain trim details has generated contempt among its critics. In the future, Apple's software design won't just be a collection of human interface guidelines that defined the original Macintosh experience. Apple has also introduced a series of touch gestures on both iOS and OS X, and launched Siri as a voice-based alternative to navigating iOS by touch. Ive's task of directing the human interface design direction for Apple's future products involves a lot of different disciplines. It also must balance one extreme of creating a singular, unchanging software appearance that is rigidly enforced throughout the company (something that could quickly appear outdated or boring) with an experimental, flexible and evolving sense of design (that invites criticism from people used to things working a particular way). Apple's design future will also need to balance the extreme of sophisticated, minimalist, utilitarian design with the whimsical, rich and customizable options many users like. In that regard, Ive is more likely to favor Apple's traditional route of leaning toward clean, expertly designed layouts, scaling back some of the flourish of Calendar and the oddball OS X Contacts. However, based on Ive's own words about his design ethos, its likely he will want to do more than just ensure Apple has a unified design language across its software platforms. Ive's desire to rethink products from their starting point would have to require a fresh perspective of things that have grown stale. For example, when the iPhone launched in 2007, audiences were impressed with its weather and stock widgets. However, despite years of dramatic change in the mobile industry centered around Apple and its App Store, the company hasn't given either app any real rethinking. Being able to see live weather forecasts right on the map is technically possible, but Apple still expects users to type in a zip code to see a generic weather widget card for a given area. There are already third party apps that acknowledge that the weather in any given neighborhood of San Francisco is very different, so why doesn't Apple recognize this? And Apple's Stocks widget still taps into the pathetic news feeds of Yahoo's spam-Finance, which is even worse now that in it was in 2007. Has nobody at Apple checked the company's stock price recently? The Stocks widget, apart from getting Siri integration, offers nothing more than a series of worthless links to click-through sites that offer no insight to anything in the richly complex world of finance. If Apple can't maintain all the new apps it bundles with OS X and iOS, it either needs to drop them or expand its resources devoted to keeping them fresh and functional. In comparison to iOS, OS X is even worse, with tons of half finished apps that somehow keep making it into the latest release (such as the odd grab bag know as Image Capture). Other incremental initiatives have joined and split in various ways, such as the strange mix of iChat/iMessages and FaceTime. Apple's biggest mess of a product is also perhaps its most famous: iTunes. While recently delayed a few weeks, iTunes 11 at least promises to rethink how the app should work, a very good sign that the company does indeed know how to fix things. A bigger question is how valuable the company sees similar investments in rethinking messaging, or access to information, or streamlining free apps like Safari for pure performance and usability. Cook has frequently repeated the notion that Apple knows how to say "no" in building hardware products (often boasting that all of Apple's products could fit on the same table), but its software is often scattered and directionless, a huge task for Ive's group to take on. However, it appears that Ive has been chomping on the bit for the chance to do just that for some time, and the reassignment of Forstall's duties will finally give Ive the opportunity to redesign Apple's software as impressively as he has its hardware.